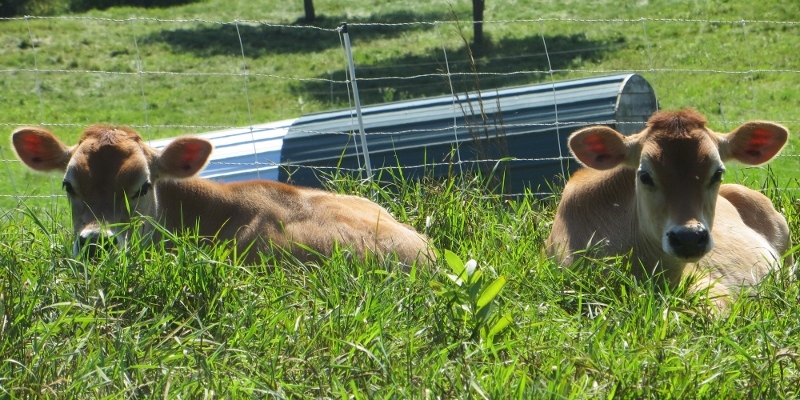 We will have some delicious lamb and 100% grass-fed beef for sale by the cut this fall. email wintermoonfarm@gmail.com for more info. I have a hunch. I am pretty sure most pregnant women do not spend their third trimester fretting over where to house the sheep for the fall, how many beef cows to overwinter, how to manage pig farrowing in and around one’s due date or what milking the family milk cow will look like upon the baby’s arrival, but lately my mind is a swirling wash of such questions. And so, even though it is late-July, and I should be focused entirely on summer grazing rotations and hot little boys, October is at the forefront of my every decision. Sheep preparations: By October 1 we aim to have the sheep in their breeding groups. Provided I don’t go into labor early, we should be able to accomplish this pre-baby. The big question is, how will the grass hold up? Will we need to truck all 60 animals home or will they continue to have enough feed up the road. Hmmm, no way to know! Beef cow preparations: We just received word that the herd of 11 cows I mentioned a few newsletters ago will be ours as of September 1. This will bring our herd total to 28 animals for the winter. Again, will there be enough grass in the remote pastures to carry all of these beasts into October or should we plan to truck them home early? And, as we count up our growing pile of hay bales, exactly how many bales will we need this winter? Pig preparations: Here’s one area I THOUGHT we were all set on however Gabe informed me last week that two of our sows are due to farrow in early-October. Now, if I had realized this was the plan when the boar was put in with the girls I would obviously have voiced my disdain, but alas, times are busy and the pig gestation was poorly, or perhaps not at all, planned. Good luck Pansy and Posey, you might be on your own this time! Jeannette preparations: Perhaps the most planning, at least this moment, revolves around my milking schedule. Usually I milk around 5:30am and 4:00pm, not exactly 12 hour intervals, but Jeannette doesn’t complain and it seems to fit into our family’s daily rhythm. There is no way however, I will be trudging out to the barn come October for an early morning milking AND I have decided that milking just once a day would be much more convenient as we enter this new phase of our lives. This means, I am in the midst of transitioning Jeannette to once a day milkings. Her morning milking will remain unchanged for the time being, but each afternoon I milk her a bit earlier. For example, the past two days I milked her at 1pm and today I will head out at 11am, just 5 hours after her morning milking. What this means: In a few short days (if all goes well) our girl will be down to one milking each day and I will be resting with my feet up come 4pm…well, at least the former will be true, as for resting with my feet up…we’ll see. So, yes, while it is July and we are moving animals about on grass, checking watering troughs vigilantly and squeezing in trips to the beach with Eben and August, October 10 is my focus. Perhaps the so-called “nesting” phenomenon so common among late-pregnancy women is simply manifesting in a slightly different way for me – scouring the house, not so much…animals all snug and accounted for, a constant concern. 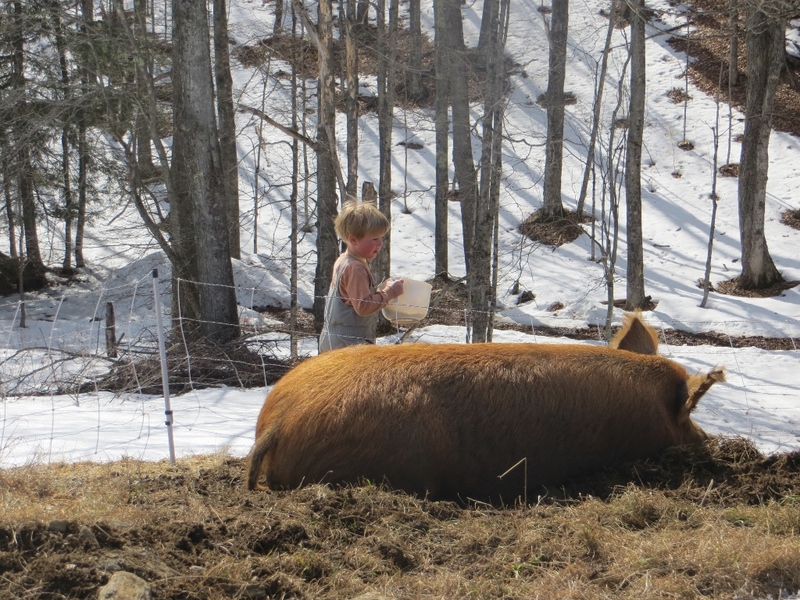 Learn about our Pastured Meat Farm Share. Sample and purchase local, sustainably raised meat at the source. 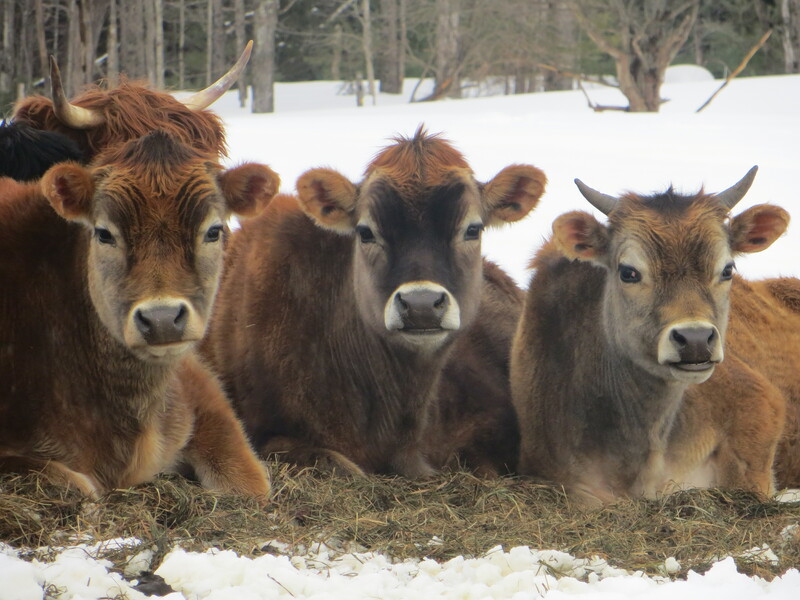 Learn about rotationally raised, grassfed and pastured meats. 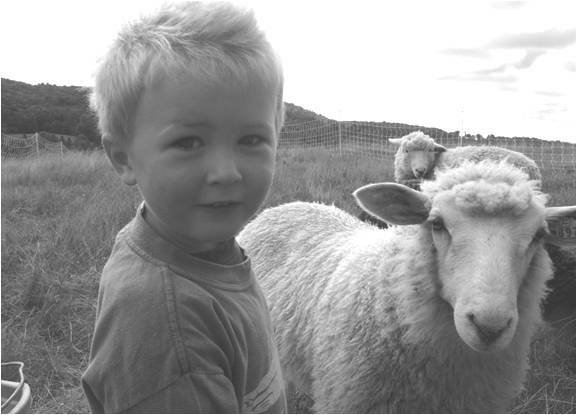 See baby lambs, piglets, cows and chickens. Directions: From Bradford, VT: follow Route 25N for ~7mi. Turn left onto Brook Road. Follow Brook Road and turn right onto Center Road. Take the second driveway on the right, “Towle Hill Lane”. We are up the drive to the right, #138. This little poem, which Gabe’s family members traditionally race one another to recite on the first of March each year, perfectly illustrates what is to come on the farm this month. As temperatures gradually rise and the snow steadily recedes, we are preparing for babes to be a part of the farm once again. Crescent, our “prize” sow, is cozy as can be in the barn. Her nest building appears to be complete (an act that all sows go through prior to farrowing) and we are patiently awaiting her first signs of labor. Each morning I enter the barn to her soft, rhythmic grunts unsure if her noises are simply those of a sleeping pig at rest or rather, those of a large mama laboring through the birth of her brood. One morning soon, I am certain the latter will be the case. The ewes, while slightly behind Cres in their gestation, are also gearing up for their big day. Last weekend we moved them all into a new pen in the barn where we can easily monitor their progress and isolate each ewe when her lamb(s) “drop” – a lowering of the lamb(s) into the ewe’s birthing canal that leaves hollow-like depressions on either side of her spine and tells us that lambing is imminent. With any luck, we will have a healthy lamb crop springing around the barnyard within a month. And, for those of you who have never witnessed a baby lamb in all its glory, let me tell you they are the epitome of springtime joy. The final mother-to-be preparations around the farm revolve around Jeannette. Although she is not due to calve, or freshen, until the first of May, she will be dried off by March 1. “Drying off” a dairy cow is the standard practice of ceasing to milk a cow for a period of time, most generally about 2 months, prior to freshening. This break in milk production allows the pregnant mother to put her energy into her growing calf and maintain a healthy condition. Hopefully a little break will also serve to cheer up our girl who has been full of “spirit” lately…otherwise known as a shifty, shaving-kicking beast that I will be glad to take a brief respite from! And so, in closing, if you too feel that this winter has dragged on long enough, remember to look ahead rather than behind. Focus on the changing light, warmer days and the “little birdies” that are beginning to sing overhead and remember that this too shall pass and spring will come again!